At SIGNiX, we record a history of what each document looked like at the time it was signed, and we embed that history into the document—we call this Signature History™. This can be especially useful in multiple signature and party workflows. If one signer questions the content of a document at the time of signature, afterwards other parties can go back and see exactly how the document looked when that signer signed. The photo to the right shows an example. The first version of the document shows Jane Human’s first signature on the document. You can see that the second signer hasn’t completed his part of the process yet. The second version shows the final signed version of this sample two-party NDA. Most importantly, the Signature History is available within the document, even if you’re not connected to the Internet. 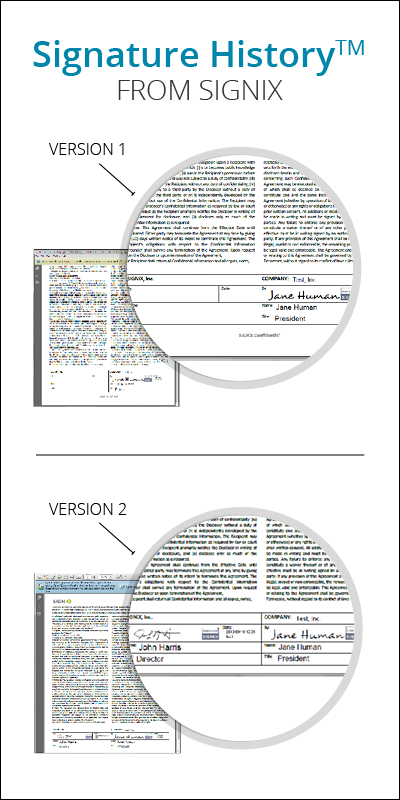 If you have received a document with more than one signature, you can take a look at the embedded Signature History within compliant PDF viewers on Windows and Mac computers by simply right-clicking on a signature and choosing ‘View Signed Version.’ Simple, right? Download our white paper to learn more about MyDoX, our cloud-based digital signature product.